The 100: Who's Still Alive in "Blood Must Have Blood, Part One"? The CW has released the official description for The 100 Season 2 Episode 15, "Blood Must Have Blood, Part One," airing on Wednesday, March 5.
Who's alive in the first hour of The 100 Season 2 Finale? 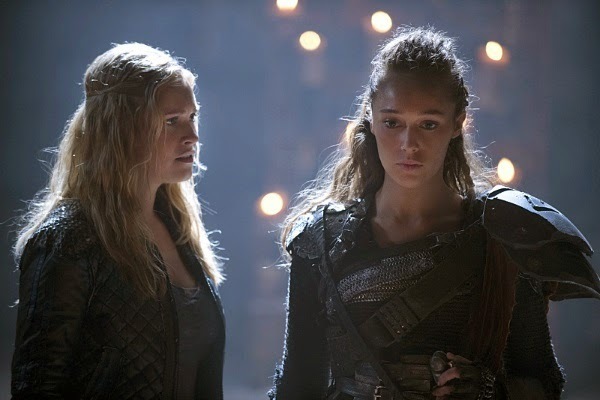 ONE STEP FORWARD, TWO STEPS BACK — Clarke (Eliza Taylor) and Lexa (guest star Alycia Debnam Carey) prepare for battle, while Raven (Lindsey Morgan) and Wick (guest star Steve Talley) experience a major setback. Meanwhile, Octavia (Marie Avgeropoulos) and Lincoln (Ricky Whittle) are each forced to make a difficult decision. At Mount Weather, Jasper (Devon Bostick) and Maya (guest star Eve Harlow) witness a horrible act, Bellamy (Bob Morley) follows through on a promise and Cage (guest star Johnny Whitworth) goes public with powerful information. Paige Turco, Isaiah Washington, Henry Ian Cusick and Chris Larkin also star. The episode was directed by Omar Madha and written by Aaron Ginsburg & Wade McIntyre. Does this make you happy? Worried for someone not listed?